Continuing financial uncertainty is quickly boosting silver's appeal as a precious metal. And as a result, the white metal is rapidly the investment of choice for those who recognize its traditional role as a safe haven asset. GFMS Ltd. – the world's leading authority on precious metal markets – reported that silver investment increased by a whopping 184% to 137 million ounces in 2009 compared to the previous year. This was the highest level in the past two decades. Sales of silver bullion coins increased by an impressive 21% to post a new record of 78.7 million ounces last year, mainly driven by a pop in retail demand in the United States. For the month of May 2010, the U.S. Mint sold 3.6 million Silver Eagles — the highest monthly sales since 1986, worth approximately $67 million. 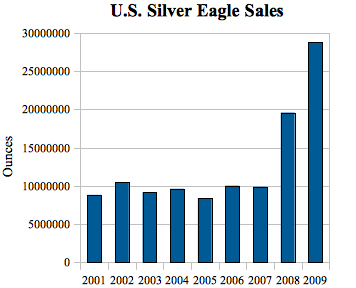 May marks the third month so far in 2010 that Silver Eagle sales have topped 3 million units. Silver is quickly becoming the preferred investment to safeguard against a fragile global economy. 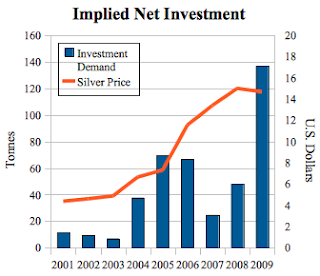 And as investment demand continues to grow, silver prices will march higher. The time to invest in silver is now.